Matrix Easy Fit Backs are infinitely adjustable and can be built during a direct fitting with a patient. Once the Matrix Easy Fit Back is properly formed, each section of Matrix is locked into place to create the client’s shape. If adjustments need to be made, the appropriate section or sections are simply loosened, moved into place and then retightened. In order to increase or decrease the Matrix Easy Fit Back, segments can be added or removed. Increase or reduce back dimensions to accommodate a client’s weight gain or loss and/or a pediatric client’s growth. Increase or reduce back depth, adjust tilt and asymmetrical positioning with easily adjustable mounting brackets. Unparalleled ventilation, promoting skin integrity. Matrix Easy Fit Back can be mounted to the canes or back pan of any wheelchair via Matrix pivots that allow for asymmetric mounting, depth adjustment and complex curves. Matrix breathable Airmesh covers minimize heat and moisture retention while maintaining softness for direct skin contact. Matrix custom covers are secured in place to ensure there is minimal shifting around complex contours. Open-cell heat resistant foam cushion offers unparalleled ventilation promoting skin integrity. If you are not an approved vendor, fill out a Matrix Seating USA Vendor Application to set up an account and get your pricing. 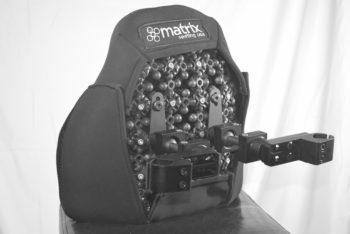 Print, sign, fax or email completed forms to Info@matrixseatingusa.com | 800-986-9319.